Photo from the Illinois Digital Archives. In recent years, Illinois has added a number of items to its list of official state symbols. Oftentimes, these ideas are produced by local student groups seeking to bring some recognition to an important part of their community or the state as a whole. Some good examples are the 2015 designation of sweet corn as our Illinois State Vegetable and the 1980 selection of the white-tailed deer as the state animal. Illinois has had a roster of state symbols from its beginning as a state, starting with our state seal. Some of the early state symbols included our state bird, state tree, state flower and state song. This is the story of how those early symbols were chosen. The state seal has been in use almost since statehood. Its creation was one of the first acts of the First General Assembly in February 1819, just two months after statehood. Prior to statehood, official documents were stamped with the seal of the Northwest Territory (starting in 1788), the Indiana Territory (1800) or the Illinois Territory (1809). While it was believed to be similar in appearance to the current state seal, the exact design of the original seal was thought to have been lost until 2002 when some Madison County court records from 1819 which bore the original seal were uncovered in the State Archives. Similar in appearance to the federal seal, the state seal has a key difference: the American eagle holds in its beak a scroll with our state motto upon it: State Sovereignty, National Union. It was this motto which would be the focus of an intense dispute when the state seal was re-designed in 1868. In 1867, Secretary of State Sharon Tyndale approached State Senator Allen C. Fuller to encourage him to introduce legislation calling for the creation of a new seal. Tyndale proposed a wholesale redesign of the seal: the federal shield would be moved from the eagle’s front to a position on the ground, the eagle would no longer clutch arrows or an olive branch, and the eagle would stand atop a large rock in a field in front of a brightly shining sun. 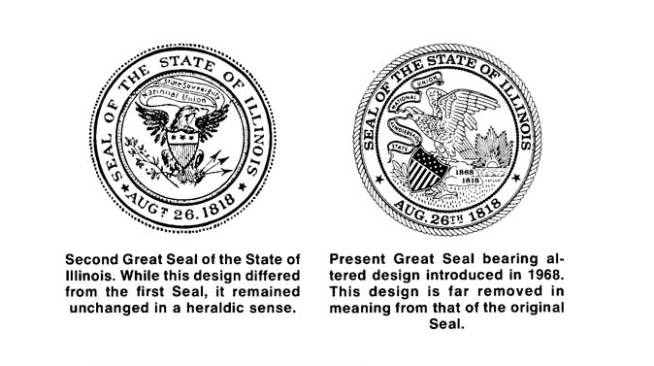 Side-by-side of Illinois State Seals. Photo from the Illinois Digital Archives. None of this appears to have been controversial, but one change did catch the eye of legislators: Tyndale sought to reverse the wording of the state motto. Under his proposed design, the motto on the scroll would have read “National Union, State Sovereignty.” A Representative Dinsmore from Whiteside County attempted to amend the bill to erase all the changes. While his amendment failed, it did call attention to the change in the motto. Tyndale apparently never publicly explained why he proposed this change, but one possible explanation concerns the fact that it occurred just two years after the conclusion of the Civil War. The war had been fought in part over the question of which would take supremacy: state sovereignty, or national union? Tyndale perhaps sought to clarify the issue by placing National Union right up front. Though his change to the motto was eventually removed from the legislation re-designing the seal, a smaller change did make it into the final design: the word “sovereignty” was now printed upside down. 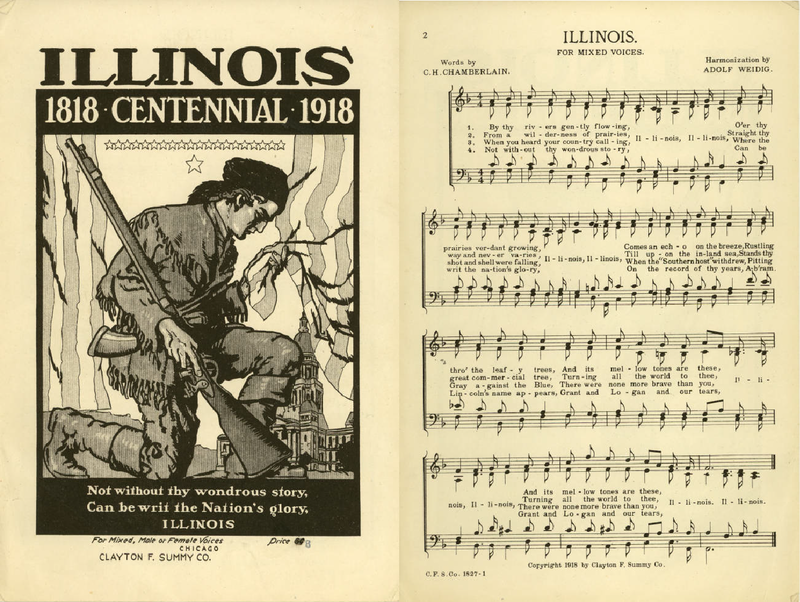 “Illinois” songbook printed for Illinois’ Centennial in 1918. There were none more brave than you, Illinois! However frequently it was heard in the state, “Illinois” did not become the state song until 1925, when Senator Florence Fifer Bohrer of Bloomington introduced legislation to officially proclaim “Illinois” as the state song. The bill passed both houses unanimously and was signed into law by Governor Len Small. 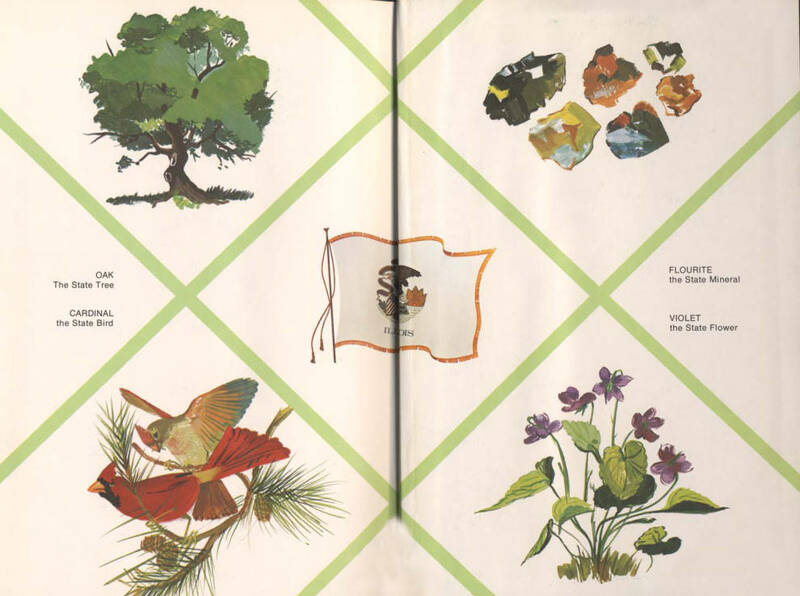 Schoolchildren began to get into the act of creating state symbols with a 1907 effort to designate a state tree and a state flower. The idea originated in Rochelle and quickly spread to schools around the state. In November of that year, students voted to select the oak as Illinois’ state tree, decisively beating out the maple and elm. They also chose the violet as the state flower, though the wild rose was a close second. Following the selections of the students, legislation was introduced in January 1908 to designate the oak as the state tree and the violet as the state flower. The bill quickly passed both houses and became law on February 21, 1908. 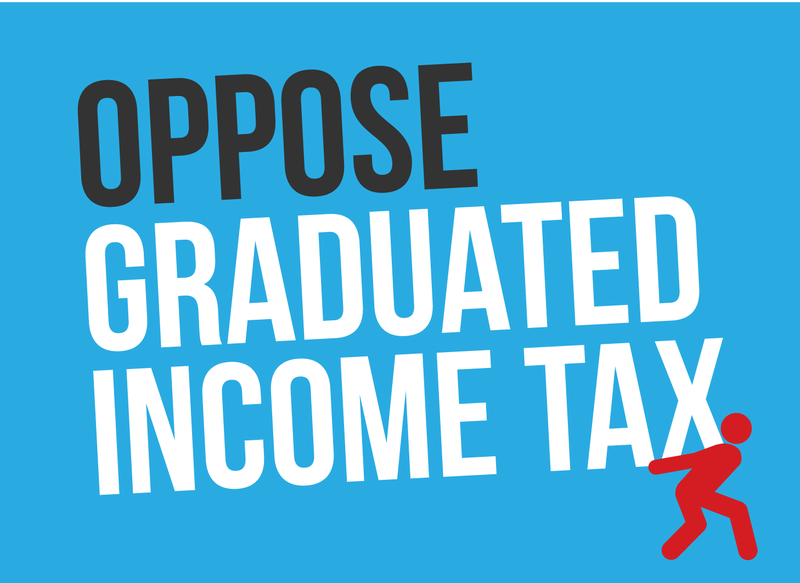 But students weren’t done with this issue just yet. In 1973, 900,000 Illinois students voted in favor of a slight change to the designation: switching the state tree from the native oak to the white oak. In 1928, the Macomb chapter of the National Federation of Business and Professional Women worked with Illinois’ Superintendent of Public Instruction to present the question of a state bird to students and their teachers through that year’s Arbor and Bird Day Circular. It was part of an educational effort to encourage students to learn about Illinois’ birds and their importance. Five possible state birds were listed on a ballot included in the circular, though there was also space for other nominations. Students in 96 of the 102 counties participated in the poll. When they were all counted, a total of 73 different birds had gotten at least one vote, including the parrot, peacock and buzzard. But the most popular was the Cardinal with 39,226, beating out the Blue Bird which received 30,306. The Meadow Lark, Quail and Oriole were farther down the list. House Bill 5 of the 56th General Assembly became law on June 4, 1929, and the Cardinal became the Illinois State Bird. The designation of new state symbols then took a break for a full generation, but picked up again after World War II. 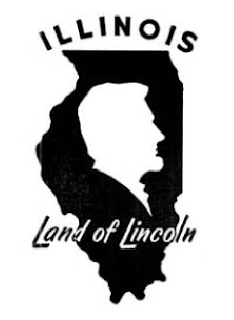 In 1955, the state slogan, “Land of Lincoln” was made official. Ten years later came our state mineral, fluorite. The monarch butterfly was chosen as the state insect in 1975, a designation which led to action in Springfield during the current 100thGeneral Assembly. 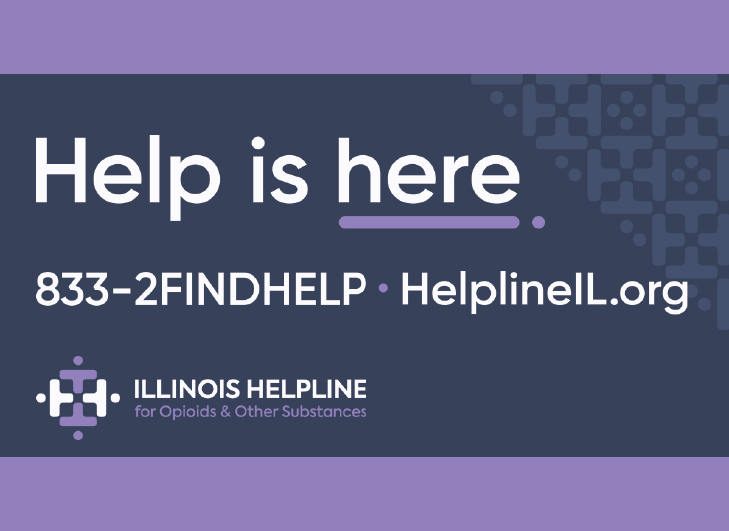 Because milkweed is essential to the life cycle of the monarch butterfly, Illinois enacted legislation in 2017 which designated milkweed as the official state wildflower of Illinois. The Secretary of State maintains the list of Illinois’ official state symbols, which are also spelled out in Chapter 5 of the Illinois Compiled Statues under the State Designations Act.